Our product range includes a wide range of rope deployment system. 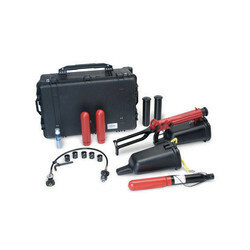 The ResQmax Kit 411 is a Surf Rescue / Messenger Line Deployment Kit supplied with two payloads and all the accessories required to operate the ResQmax. The Dacron Line is a messenger line which allows for long range horizontal deployment distances of 400ft / 122m. This line can be used to tow larger, stronger ropes across a body of water or from ship-to-shore. The Polypropylene Line has a stronger test strength of 1,100 lbs / 500 kg and is intended to be used in water-based operations which require the line to oat. This line, when coupled with the Sling Projectile, becomes an e ective way to assist a distressed swimmer who may be caught in a rip tide by delivering the ResQmax Sling within seconds. The Auto-In ating Sling has a mechanism which in ates the Sling on contact with water. The ResQmax Streamline Filler Hose facilitates charging the Projectiles with compressed air from an Air Compressor, an SCBA Tank, or a SCUBA Tank. The service pressure of these Projectiles is 3,000 psi / 207 bar. This kit comes complete with spares and a Kit Carry Bag for easy carrying. Optional accessories include the ResQmax Tool Kit and a Rigid Transport/Storage Case. Additional projectiles and lines are available with all of the ResQmax Kits.